The gap between The Front Bar and The Footy Show continues to widen with Seven’s show taking its highest-ever Thursday audience at 383,000 (including on multichannels in Sydney & Brissy). The Footy Show‘s two editions in varied slots tallied to 242,000. In Melbourne where the battle was more head to head, Seven took 261,000 to Nine’s 116,000. The Bachelor was strong at 869,000 but down slightly on last week. Home and Away (from 7pm), 7:30 and RBT followed. By 8:40pm Gogglebox led with 825,000, up on last week, well ahead of The Front Bar, Loch Ness, and The Footy Show. TEN tied on primary channels with Seven but having an extra multichannel pushed Seven to a win. Seven network won Tuesday with 30.8% then Nine 24.1%, TEN 22.7%, ABC 15.4% and SBS 7.0%. Seven News was #1 for Seven with 915,000 / 886,000 then Home and Away (566,000), The Chase (520,000 / 315,000), The Front Bar (383,000) and movie: Deja Vu (246,000). Nine News (890,000 / 857,000) led for Nine then A Current Affair (687,000), RBT (472,000), Driving Test (463,000), Hot Seat (461,000 / 260,000), The Footy Show (242,000), World’s Wildest Flights (132,000 in 2 cities). The Bachelor won its slot for TEN with 869,000 then Gogglebox (825,000), The Project (524,000 / 280,000), TEN Eyewitness News (356,000), Blue Bloods (224,000) and Pointless (207,000). ABC News (645,000), 7:30 (536,000), Grand Designs Australia (470,000), Loch Ness (336,000), Sammy J (217,000), and QI (177,000) comprised ABC’s night. On SBS it was Tony Robinson Down Under (276,000), 24 Hours in Emergency (158,000), 24 Hours in Police Custody (137,000). The Chef’s Line was 53,000. Best on multichannels was 7mate movie Kingsman: The Secret Service (199,000). Hi David, due to survivor being reduced in days from 55 to 50, is it likely that the series will also be cut short from 26 episodes to less? I would expect so, but it’s unclear. Please bring back Driving Test for Season 2! I actually think there is a lesson to be learned from The Front Bar, Television doesn’t have to be perfect, they fluff there lines and lose there place in how the show is running at times. However it makes no difference, well it does in the sense that it makes the show endearing to the audience watching, because it comes across as they are talking to you not at you. 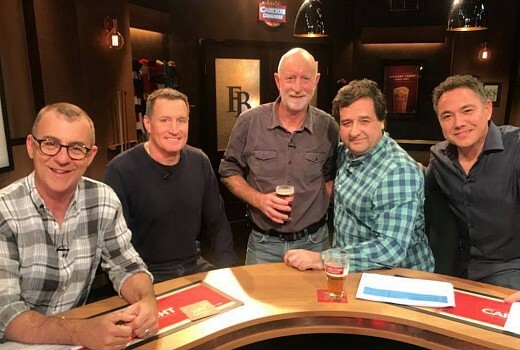 Well done Andy, Mick and Sam you have gone from a YouTube show to a 7mate show to a 7 show (in AFL states) and it’s worked, in fact much like a show coming up via Community TV would. It almost makes me wonder what would happen if say TEN picked up the Marngrook Footy Show and put it on One. Agree. It’s refreshing to see a show where the banter is real, and the hosts aren’t. reading. off. an .auto. cue. most. of. the. time. Thursday night is Tens again….good viewing. Watched Playing for keeps on ten play. Potential to become addictive viewing! Good cast, well paced, and most of all fun! R.I.P AFL Footy Show. There’s no coming back from that gap, the audience has well and truly moved on.